If you are reading this, you may be a member who has registered with ThaiLoveLines.com but did not complete an online profile or it has been rejected for some reason. When you login to ThaiLoveLines.com, you have a chance to complete this process. It takes about 60 seconds and all your previously entered data is saved. No need to start all over again. You should understand that it is only fair that all members online have full and complete data so that other members know who they are communicating with. We would also advise that you take this opportunity to provide a full and appealing profile to generate maximum interest. Key to this is a photo and you will find other assistance pages on how to upload your photo and guidance on what makes a good photo online. 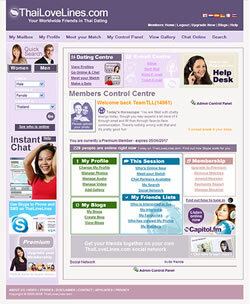 ThaiLoveLines operates a Pro-Photo Policy and restricts profiles without photos uploaded. When you complete the Place Profile page you find on logging in, you will be asked if you want to provide Skype ID information and complete a personality profile. This is optional and can be skipped. You can always provide this information at a later stage if you wish. But it is recommended to do it now and to make your profile as detailed as possible. After completing this page, you will have access to the site but your profile will not be visible and communication facilities will not be operationaluntil the profile has been approved. Grab attention with the opening line. Try a quote from a favourite book. Talk about your interests and desires. Invite other members to act. When you make an effort, you will find that you have more words to express yourself than the minimum required. This should be the case. 120 words is simply not enough. By taking your profile more seriously, you will be rewarded by having many more replies from a greater variety of other members. Result: You will find someone extraordinarily special who will transform your life. Worth 3-5 minutes? (Above) Don't forget that your profile, which appears in short and long forward represents you and is successfully to the degree of care taken with it. (Below) You can adjust your profile in many ways from the Members Control Centre.